-No need to install drivers, portable, flexible, plug and play. 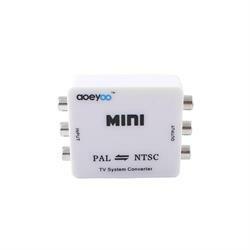 -Support PAL,NTSC3.58,NTSC4.43,SECAM,PAL/M,PAL/N standard TV formats input. -Support PAL,NTSC standard TV format output. -Input ports: 1xRCA (Yellow,White,Red). Output ports:1xRCA (Yellow,White,Red).